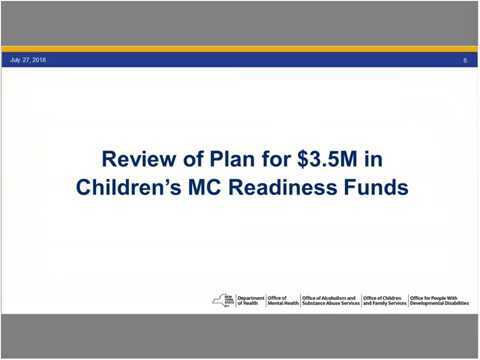 The New York State Office of Mental Health, Office of Children and Family Services, and Office of Alcoholism and Substance Abuse Services held a webinar to review the State’s proposal for use of Children’s Readiness Funds. These funds will help prepare Children’s Behavioral Health Providers to deliver new Children and Family Treatment and Support Services and Children’s Aligned Home and Community Based Services. Target Audience: This webinar is open to all Children’s Behavioral Health Providers.